Like many of us at Bryant Park Corporation, Paul Romero, our Director of Tourism & Visitor Services, wears many different hats. 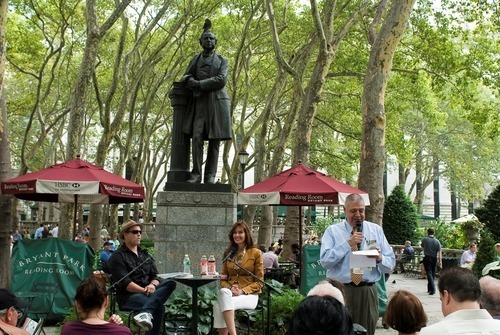 In addition to managing a staff of visitor services representatives for Bryant Park and the 34th Street Partnership district, Paul oversees Bryant Park’s famous Reading Room and coordinates Reading Room programs like the Word for Word Writers and Word for Word Poetry series. Paul also happens to be an active poetry enthusiast outside the office walls. He recently participated in an exciting event in the world of poetry, the Grand Slam Finals of Urban Word NYC’s 12th Annual Teen Poetry Slam. Paul was invited by Michael Cirelli, a Word for Word Poetry alum and Director of Urban Word NYC, to be a judge at the Grand Slam Finals which took place last Saturday night at the renowned Apollo Theater in Harlem. Urban Word is an organization that hosts free creative writing, journalism, college prep, literature, and hip-hop workshops for teenagers, and fosters young talent in an uncensored environment. The organization coordinates numerous poetry slams every year to encourage free self expression in its talented young poets. At Saturday’s Grand Slam Finals, Paul and his fellow judges, including poet and Word for Word alum, Aracelis Girmay, actor/poet Carlos Andres Gomez, community activist and documentary film producer/director, Lisa Russell, and rapper Homeboy Sandman, narrowed the competition from 23 poets, to 12, and finally to 6 young poets who will travel to Los Angeles for the National Championships. Recounting the event, Paul said that he was amazed by the performances of the talented teenagers and the powerful content of their original poems. From humorous pieces about men in high heels to political prose and personal tragedies, their words moved the entire audience at the sold out Apollo. Paul described many of the performances as fast, loud, and expounding, and said he had a wonderful time at the event. We look forward to welcoming the young poets from Urban Word at Poem in Your Pocket Day on April 29 in the Reading Room. 2010 marks the organization’s fifth consecutive year of participation in the event.